Happy November! We weathered Hurricane Sandy safe and sound. We never lost power, and no trees fell on anything nearby. My heart goes out to everyone on the Eawt Coast who didn’t fare as well. The recent extreme weather patterns are downright scary. Anyone who says there’s not such thing as climate change is delusional. While Sandy might have been the Storm of the Century, rising sea levels and warming ocean temperatures certainly contributed to making this hurricane extra powerful. We managed to win the annual challenge of waiting until November to turn on the heat. The weather has been so mild, temperature wise, that it wasn’t even a stretch. The forecast shows daytime highs only in the 40s and freezing overnight temperatures coming this weekend, so the heat will be on soon. Colder weather calls for comfort food. Lovely autumn vegetables were calling out to me during a stroll through the l0cal farm stand. I came home with leeks, anise, , sweet potatoes, and parsnips. I already had carrots, butternut squash and potatoes at home. It seemed like the colorful array of vegetables would make a gorgeous pot pie. 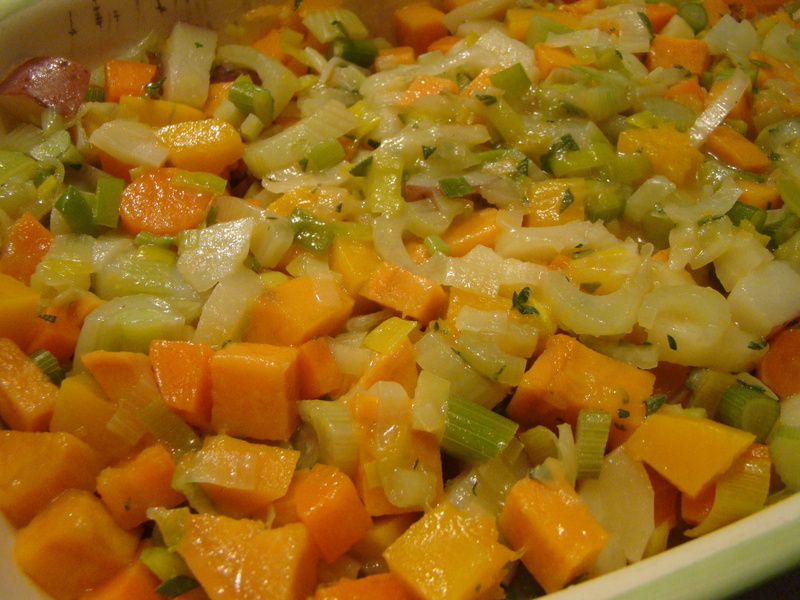 I diced the squash and root vegetables into small pieces and, separately, steamed them until just tender. Then, I sautéed the leeks and anise until they softened. The steamed vegetables were gently folded in along with a generous handful of chopped sage and thyme. Everything was bound together with a velouté made with vegetable stock. I turned the vegetable filling into a baking dish and topped it with a thin biscuit-like crust. 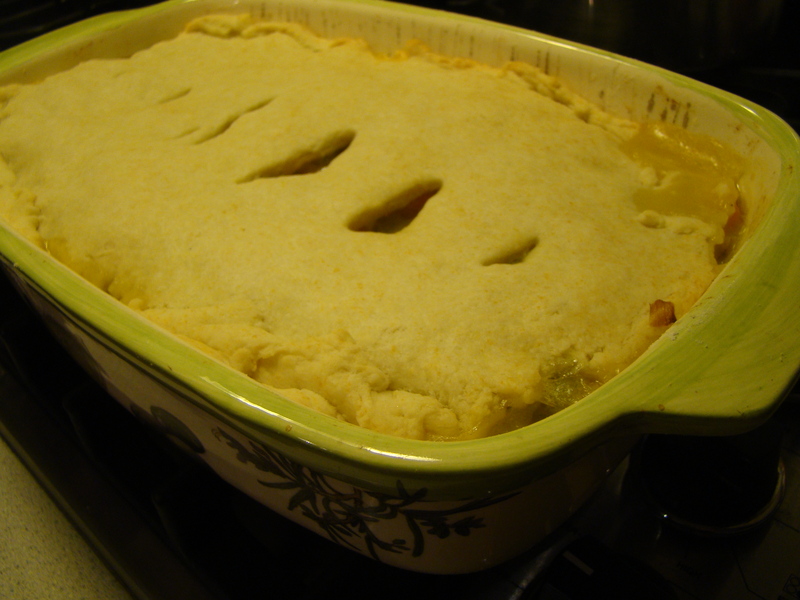 I baked the pot pie until the filling was bubbly and the topping was lightly browned. One at a time, steam each of the following diced vegetables until nearly tender: carrots, parsnips, squash, sweet potato, potatoes. Each vegetable should take 5-8 minutes. As each finishes cooking, transfer to a large bowl. In the meantime, heat the olive oil in a large skillet over medium heat. Add the leek and sauté until it starts to soften. Add the anise and continue cooking until tender. Add to steamed vegetables and stir to combine. To make the veloute, in a saucepan, melt the butter. Whisk in the flour and cook for 3-5 minutes, until the flour is cooked and lightly golden. Slowly whisk in the stock. Cook over medium high heat until the sauce thickens, about 5 more minutes. Pour the sauce over the vegetables. Add the chopped herbs and gently stir to combine. Transfer the filling to a baking dish. I use a 12×7 pan, but you could with 13×9. Prepare the Pot Pie topping. In the food processor, pulse together flour, baking powder, and salt to combine. Add the butter, and process until the mixture resembles sand. Add ¼ cup of milk, and pulse until the mixture comes together as a dough. Roll it out on a lightly floured surface to a size that will fit on top of the filling. Place topping over the filling. Brush with milk. Cut a few slits for steam to escape. Bake for about 30 minutes until filling is bubbly and topping is lightly golden. It was the perfect thing to eat while waiting for trick-or-treaters to come by for candy. 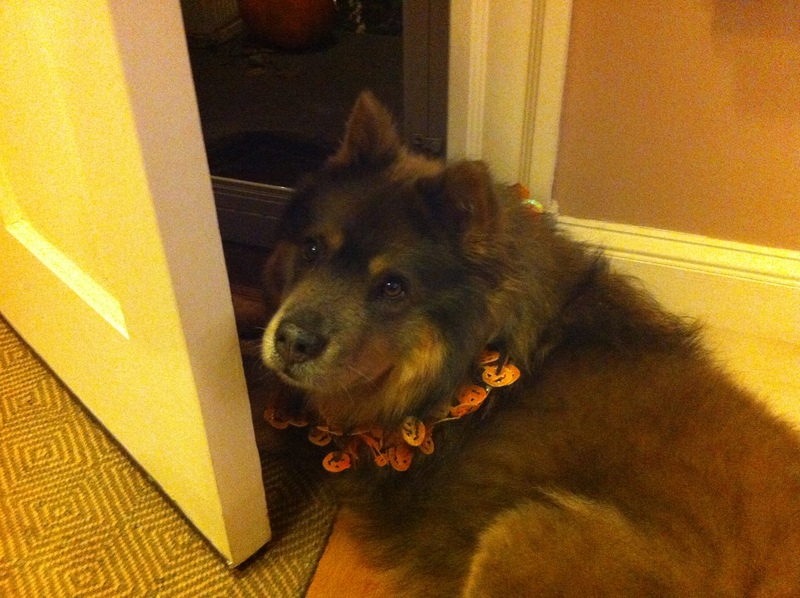 Bella waits at the door for Halloween visitors. Check out her holiday collar! Last, but not least, I’m pleased to announce the winner in the honey giveaway. I used a list randomizer to select the winner. Candy of Dulce’s Home wins a jar of my newly harvested backyard honey. I’ll be touch to get your address so I can send the honey your way. Congratulations, Candy!